My objective for clients is always to increase market share and profit margin at the same time. This means you will sell more new homes, and you will sell them at higher prices. Because you will feel increasing demand from prospective buyers, you’ll have more freedom to decide just how many homes you want to build in a year. You’ll also have greater ability to set your prices where they need to be to cover your costs, reward your key people, pay yourself a decent salary and put some serious money away for your future. And, when you operate with confidence like this, you’ll discover the true magic of marketing: People will happily pay a premium if they think you’re worth it. Making this happen is a marketing challenge first, and a sales challenge later. I can help you with both, and I promise you can afford me. So please, let me show you how this works. As a way to envision what’s needed, I drew up the flow chart diagram for The Performance System sitting at my kitchen table one evening back in 1986. True story. A miracle. In the years since, The Performance System has become the standard of marketing and sales practice in the industry. In fact, this very Performance System you’re learning about right now is taught to students in each of the four educational courses leading to the coveted professional designation, Master In Residential Marketing offered by the National Association of Home Builders. 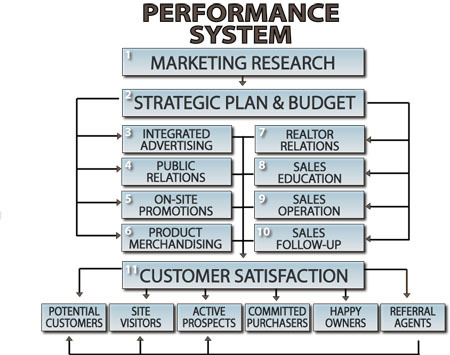 The Performance System includes all of the marketing and sales activities that are necessary to maximize success. Look at the accompanying diagram and follow the flow of the arrows, if you will. Guided by Market Research and controlled by the Strategic Plan and Budget, each individual marketing and sales activity plays its role in producing Customer Satisfaction. It is Customer Satisfaction, at each stage of the buying process that moves Potential Consumers along the path of growing commitment until they become Happy Owners, acting as Referral Agents, procuring additional customers for you. It all starts with Marketing Research. Analysis of the balance of supply and demand for your contemplated product type in the market area may point out an un-met need which you can fill. If so, further research should be conducted to pinpoint the demographic, economic and psychographic characteristics of the specific consumer market you want to target. With this information you can design a product with the exact combination of features, benefits and value that will appeal to your target market and which you can deliver at a price they can afford. Get this! It’s not about what you want to build, it’s about what they want to buy. Figure out what that is, and you’ll be ahead of the game from the start. Proper research will also help you formulate a sensible absorption prediction for the product you plan to build so you can plan an efficient marketing and sales program and make sure that if your plan comes true, you will actually make money. You would be appalled at the number of projects that were doomed before they started, because no one did their homework. The marketing and sales Strategic Plan and Budget is a numerical expression of the plan to communicate with members of your target market and encourage them to come see and buy your product. It requires that you make the tough choices between alternative marketing and sales activities so that absorption goals are met with minimum expense. Achieving predicted absorption requires that you generate a sufficient number of selling opportunities with members of your target market. If you fall behind in your prospect traffic count, you will almost certainly fall behind in your sales absorption. The sales conversion ratio generated by your sales team is the other principle variable. That is a function of the skill and energy of your sales staff and the competitive power of your product. You must also provide a pleasant and uplifting shopping experience for your prospects so that an acceptable sales conversion ratio can be achieved. The next eight activities in the Performance System are intended to help you entice the right new home shoppers to come see your product. Integrated Advertising has two principal components: Traditional Media outlets like newspaper, magazine, outdoor, direct mail, etc., and New Interactive Media opportunities like the Internet itself and the various social media channels on the Internet. Choosing where to place your message and deciding what your message ought to be remain the keys to integrated advertising success. It is hard to escape the reality that you simply must have a presence on the Internet these days. The battle between print media and the Internet is over. The Internet won. That doesn’t mean you won’t do newspaper advertising in the future; it just means that the purpose of any print work you do from now on will be to reinforce what your web site presents. New home shoppers go to the Internet first now. Most stay there. It’s a fact. Public Relations is concerned with putting the power of the implied third-party editorial endorsement to work for you in selling your products. Favorable news articles and features are probably the most cost productive of all promotional activities. Publishing a newsletter is another very productive activity which allows you to tell your story your way while preserving much of the power of the implied third party editorial endorsement. And in today’s world, the new social media channels on the Internet function much like traditional Public Relations activities. Consumers talk to one another on social media channels, and they talk about you. You’ve got to be there yourself to pick up the buzz, guide it if you can and react to it if it turns unfavorable. Acting like this isn’t going on won’t help you a bit. The principle of On-Site Promotions is inducing folks to visit your model home or development who might not otherwise come to see it. The idea is to allow all the features and benefits you have worked so hard on to generate their own buying interest. After all, your product should be its own best sales advocate, but it can only work when prospects come to see it for themselves. Parades of Homes and Grand Openings are two traditional On-Site promotions that continue to occur because they continue to work. Product Merchandising encompasses everything a customer sees during a visit to your place of business, be it your model home, your model home garage sales center, your community development or your company office. Promotional color schemes, entrance-way design, street signage, sales information center design, sales graphics, furnished models, brochures and other collateral pieces; all should make a coordinated contribution to Customer Satisfaction. They can do so if each reinforces the basic message that your product offers the best combination of utility and emotional value especially suited to your target market. The most productive single thing you can do to help yourself sell more new homes is to maintain a professionally merchandised model home. People buy what they can see, touch, taste and smell. A well executed model can pay for itself many times over. Realtor Relations is an exercise in networking; recruiting top producers in general real estate and motivating them to bring qualified prospects to your development. You must treat Realtors as a target market of their own. They must be sold on your homes before they will recommend them to their customers. Making that sale can be tough for a number of reasons, but it's well worth the effort. The Realtor Relations function takes on a whole new meaning if you list your homes with a brokerage office to sell. That can be a perfectly sound strategy – and likely the strategy of choice for a small volume home builder. But granting a listing does not mean surrendering control or responsibility for success. Agents who represent you should have received the same sales education as salespersons you employ yourself. Otherwise, they will likely place your entire business plan at risk. Sales Education is designed to make the sales staff more productive by increasing the skill with which your products are presented. It's really just that simple. A well organized sales education program should include a combination of self-administered, on-going training interspersed with periodic visits from outside sales educators. The former can concentrate on product and community knowledge, while the latter should emphasize specific selling and communication techniques gleaned from thousands of successful sales persons across the country. There is a body of knowledge which describes successful new home sales. It is intricate and it is demanding, but it is also extremely powerful and productive – worth the effort to master. New home sales has virtually nothing to do with general realty re-sales. REALTOR marketing depends on lowering the selling price to entice buyers, because there is no advocacy component to persuade buyers to buy. New home sales is all about enthusiastic and knowledgeable advocacy for your product. Allowing unknowledgeable realty agents to lower your prices defeats your business plan. You cannot allow that to happen. Sales Operations: How is the sales staff organized? Is their compensation plan self motivating? How are they presenting the product to actual customers? Does the sales information center help them sell? Do they have and follow clearly defined policies and procedures? How can sales productivity and enthusiasm be improved? These are a few of the subjects addressed in the category of Sales Operations. In the words of the old T.V. commercial, "This is where the rubber meets the road." Either you are well organized and functioning smoothly in this area, or your entire effort in all of the other elements of your marketing and sales system will have been wasted. Even when you list with an outside agency, these questions still have validity. Even more. Sales Follow-Up is critically important. It provides the supporting third dimension of continuing prospect contact which keeps the sale you are building from falling over. Everyone recognizes the value of follow-up. The problem is that few salespersons do it. Frequently, the burden of follow-up is set aside because it diverts so much time and energy away from current selling and prospecting opportunities. Fortunately, computer applications have been developed which offer state-of-the-art follow-up with a fraction of the effort previously required. Even with tiny prospect traffic flows per week, before long the inventory of prospects who have seen your products becomes huge. There are sales in that list of past visitors. You simply must be mining that list continuously looking for tomorrow’s sales. Oh, if your outside listing agency says those prospects belong to them, not you, fire them today!